It’s time to put your school and community on the BLM@School map of national events. 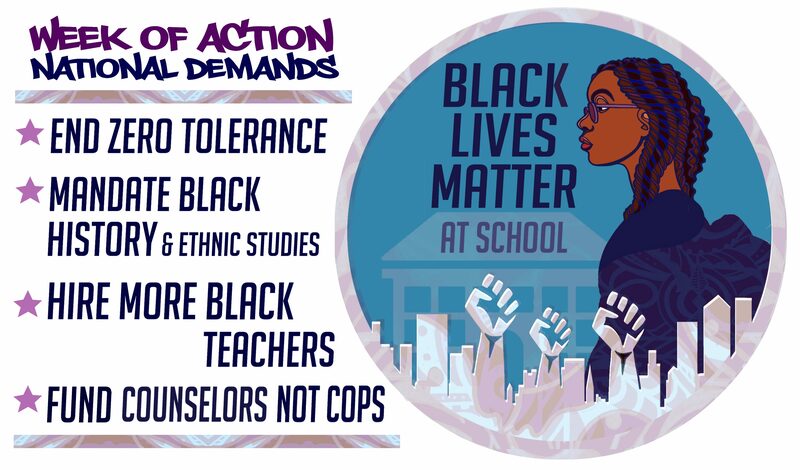 Philadelphia, Seattle, Portland, Los Angeles, Washington, D.C., Chicago, Milwaukee, Boston, Howard County, MD, Baltimore, NYC, Madison, Edmonds, WA, New Jersey, … these are just a few of the scores of cities and communities across the country where educators, students and community organizations are participating in 2019 Black Lives Matter at School Week of Action events. Please take minute to enter in the information about what is happening in your school or community for Black Lives Matter At School week on the National Education Association’s EdJustice webpage (click on the link above and scroll down to the map). There are many different ways educators, students, and parents are joining the BLM@School week of action–and we want to hear about them all! Are you and teachers at your school teaching lessons that correspond to the 13 principles of BLM? Is your school participating in the Student Creative Challenge? Is there a rally, speak out, forum, or talent showcase happening near you? Let the world know about the growing Black Lives Matter At School movement in your area!